Ali Mwebe released a statement awarding three goals and points to Police FC. Photo by Shaban Lubega. 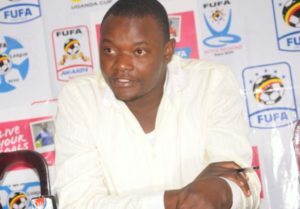 FOOTBALL–Last evening, FUFA’s competition department through the director, Ali Mwebe, released a statement awarding three goals and points to Police FC for the game they didn’t play against Masavu FC on Tuesday. According to the referees report, the new comers failed to produce licences for players before kick off of the game with Police FC and so the match was cancelled. The article further stipulates that, ‘Three points and goals will be awarded to the opposing team,’ and its the same rule that FUFA have used to ensure that Police go top of the league minus kicking a ball. Masavu have been given a deadline of 14- Spetember-2017 to produce licences for all the player although ordinarily, the window for availing players to FUFA is 21 of September. Speaking to Masavu’s head coach Alex Gita, he clarified that the submitted all paper work on Saturday but was suprised with the turn of events on Tuesday. “We submited the National IDs on Saturday because we couldnot get passports from the Internal Affairs offices. “Every Ugandan knows the issues with passports in the country at the moment so i am suprised with qhat FUFA and the UPL have decided. “We accept we lost all three points and we will be looking to get started in our next game. Masavu’s next game is a way to Proline FC on Saturday and hopeful they will have completed the licencing requirments.